Build the sales pipeline. A great marketer is usually strategic in their approach and can generate leads through research and campaigns. Marketing adds an account-based targeted approach that can open doors for sales executives. Convert the pipeline to (profitable) revenue. A proper marketing function is integral in writing content for bids, sharpening value propositions and creating the collateral that supports the bid/tender process. Marketers can communicate the company’s unique selling points (USPs) concisely and commercially, which resonate with the buyer and addresses their pains. Talk the market’s language. A proper marketing function will listen to your target audience and identify their drivers and produce content that would most likely resonate with them, so that the client chooses you over your competitors. Increase brand awareness and lower the price of admission. The right kind of brand awareness is one that builds customer trust which generates referrals (e.g. word of mouth, peer recommendations). Engage in effective Social Selling. Using social media as a tool shortens the sale cycle, keeps you top of mind, increases brand awareness and improves reputation. Be a Swiss Army Knife for your company. A marketer’s skillset can be transferrable. According to one study, one quarter of CEOs have a marketing or sales background. Market Connections understands the value and importance of marketing, especially when partnered with business development. This was made clear in a recent study with Merritt Group, 2017 Federal Content Marketing Review. 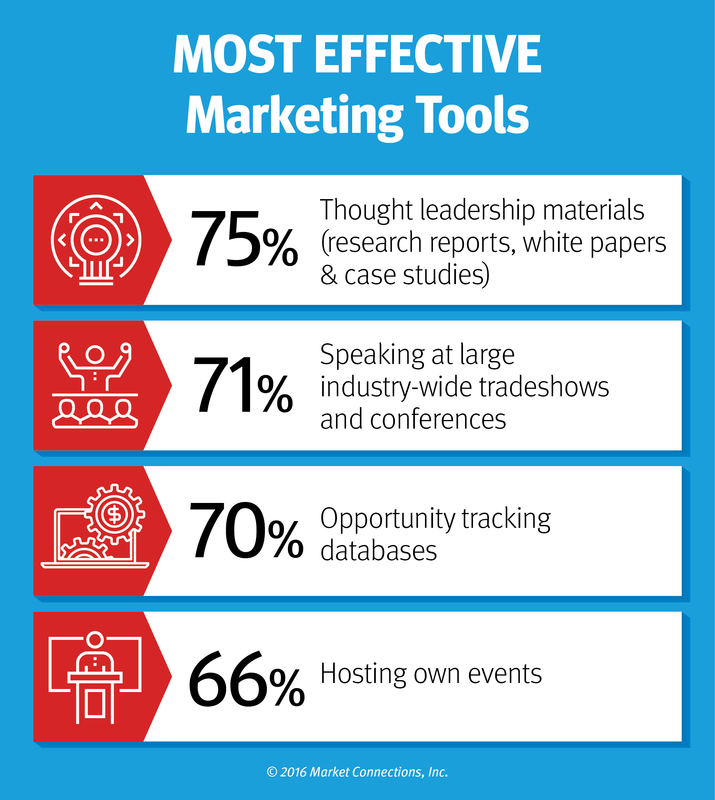 Federal procurement professionals listed marketing-created content including white papers, reports and product demos highest among the most important in helping make their decisions. To further understand the relationship between marketing and business development, Market Connections also conducts a biennial study with key partners focused on the best practices of these departments among government contractors. The Federal Government Contractor Study provides key insight on top challenges and highlights key activities that lead to success among winning contractors. 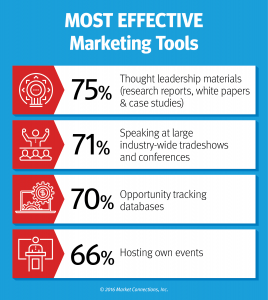 In the last iteration of the study, contractors wanting to engage with their federal customers used thought leadership materials, spoke at large industry events, tracked databases and hosted their own events to achieve the greatest success. Winning contractors (those with 50% or higher win rates) were more likely to be hosting their own events, engaging in social media, and leveraging webinars and traditional advertising more so than those with lower win rates. In 2018, a new focus of the study will be on how the two departments are structured and work together to successfully win government contracts. REGISTER FOR OUR 2018 FEDERAL GOVERNMENT CONTRACTOR STUDY BREAKFAST EVENT (July 17, 8:30-10:30 AM EDT in Arlington, Virginia) together with Professional Services Council and Merritt Group.